To further support the growth of revenues in the spirits category, Uganda Breweries has launched a new glass bottling line at its spirit’s manufacturing Plant- International Distillers Uganda (IDU) that is expected to bottle spirits about 4 times the current capacity. The 13 billion investment has a capacity of 6,000 bottles per hour, replacing the old line installed in 1950 which had the capacity to produce 1,440 bottles per hour. The Uganda Breweries Managing Director Mark Ocitti said that the new line will allow Uganda Breweries not only grow in terms of volume but also increase the number of products processed here locally. “The new capacity means that Uganda Breweries can expand the range of products that it is currently producing at the plant. “Currently, we have been producing only Uganda Waragi, V&A and Bond7 at the plant. This expansion now helps us to increase capacity of not only these products but will be able to produce some of the brands like Gilbeys , Richot and Smirnoff which we have been producing in Kenya” said Mark Ociti. Speaking at the launch of the new line, the Minister of Trade, Industry and Cooperatives Hon Amelia Kyambadde lauded the Brewery for this new facility which is poised to see the brewery, already the 4th largest tax payer, increase tax revenues based on increased capacities. “I commend Uganda Breweries for being a committed partner in our nation’s industrial development and was pleased to learn that the Brewery is utilizing locally sourced neutral spirit to produce a number of your great brands. The increased production capacity will go a long way in boosting our local sugar industries, improve government collections and reduce foreign exchange outflows.” She added. The Africa President for Diageo Mr. John O’Keefe called on the Minister of Trade to intervene on the issue of illicit alcohol that causes massive tax losses for the government due to lack of regulation. “Approximately 61% of alcohol (i.e. 676, 276 HL) in Uganda is unbranded alcohol and does not pay any tax. It is estimated that the total fiscal loss from this is USD $ 172 Million (UGX. 628Bln). In addition to this, an estimated 98% of all cases of alcohol abuse stems from this unbranded, unregulated, illicit Alcohol”. Mr. Ocitti says the state of the art line meets international quality distilling standards in order to continue producing exceptional quality and safe spirits with up to date technology that allows for versatility in the packaging process. “Our commitment is to offer alcohol consumers quality and affordable product. The new line will allow for more different brands and sizes that will suit different pocket sizes and pallets a better offering to consuming illicit or UN regulated alcohol that has proven to be harmful. This investment comes to supplement a UGX. 44 billion new state-of-the art bottling line which the brewery launched in 2010 that doubled the capacity of the Beer bottling plant. 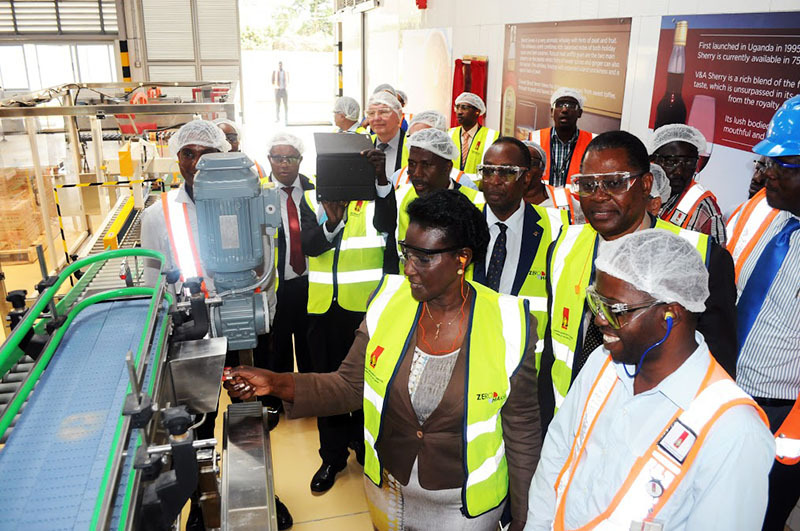 Uganda Breweries has launched a new glass bottling line at its spirit’s manufacturing Plant- International Distillers Uganda (IDU) that is expected to bottle spirits about 4 times the current capacity.